incredible hulk | It's a Mad House, a Mad House!! I know I’m two days early but the title is appropriate, especially this year. So what’s going on this week? In movies, Shannon and I are leaving the boy with his grandparents and going to see The Incredible Hulk. Everyone keeps telling me to go see Iron Man, but the Hulk and Spiderman are the two comic books I’ve been reading since I can remember being on this Earth. Cinematically Correct is trying to avoid a much worse fate than seeing the Hulk. In some ways the Hulk gives me a good parenting philosophy. Don’t make me angry, you wouldn’t like me when I’m angry. In comics as movies news Leonardo Dicaprio is the new rumor as the movie version of Captain America. I don’t think they’ve come up with a good choice yet. More viral marketing for The Dark Knight here. (Thanks to Electricity & Lust for the last two items). They’ve got a GREAT post this week. The AVClub has its regular Comics Panel. In technology, thanks to Cinematically Correct for introducing me to the search engine that gives you motion sickness… Viewzi. It’s been a light week otherwise. Thankfully it’s over. I’ll share some thoughts on the Hulk once I see it. I actually got out and did stuff this weekend. What a shocker! First my dad and I want to see Jakob Dylan on Friday night. The show was good and I’ve written my thoughts over on yet another specialized blog. Second, we bought Cloverfield on Pay-Per-View. I’m still thinking about the movie but I think Shannon may have gotten it right when she said they remade Godzilla with a handheld camera… I don’t want to spoil anything, but the movie was pretty good. I really wish that we had a few more answers. An outside perspective would have been interesting. After a while I got tired of all the super good looking kids running through Manhattan expressing undying love for each other. I was kind of missing the fat guy with bad facial hair that provides comic relief (like in the Godzilla movies). Again, showing that we’re ahead of the times we’re going to watch the end of season one of Battlestar Galactica. It might actually encourage us to get Netflix. 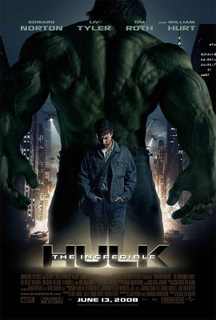 Next weekend Shannon is going to take me to see The Incredible Hulk for father’s day. I’m kind of psyched!